There are over 1 million licensed attorneys in the United States. Most of them, about 74 percent, work for a private practice. Why do these numbers matter to you as an attorney? Because they illustrate that the legal field is enormous, and that means you have serious competition. Attracting new clients requires a different approach than it has in the past. It used to be that an attorney could gain new clients based on reputation and word of mouth alone. While personal recommendations are still a major contributing factor in clients choosing a law firm, you can’t count on that alone. Communities have gotten larger, and law firms more numerous. To put it simply, there are too many opinions for someone looking for an attorney to sort through. To attract new clients, you need a plan, and it needs to include email marketing. 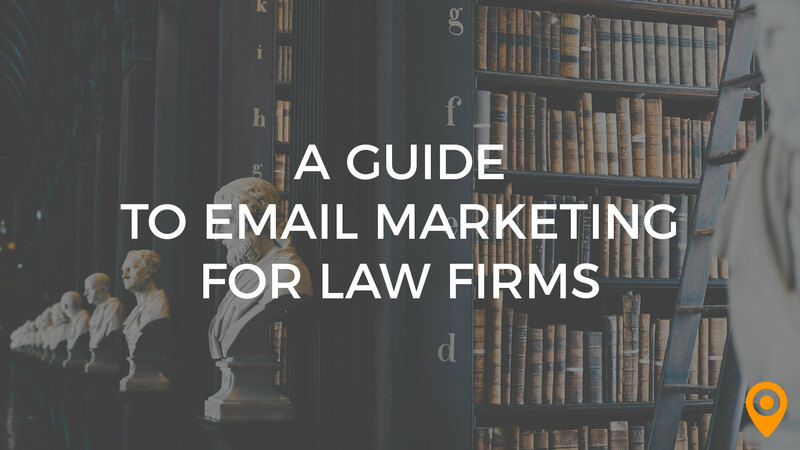 Email marketing is one of the most effective ways for law firms to build their reputation and attract new clients. What do these numbers tell us? 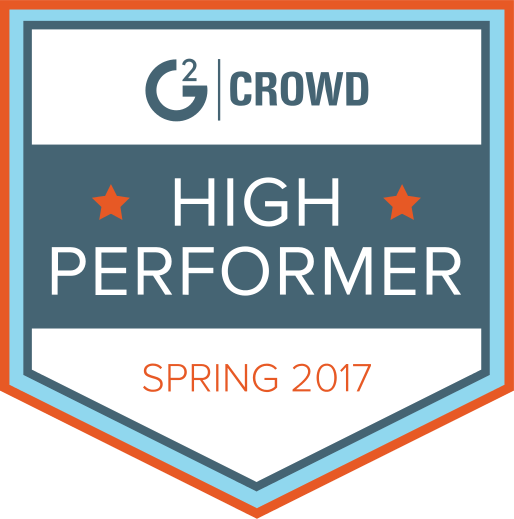 They tell us that there is room for improvement, and that means room to build new leads and new client relationships. Are you ready to revitalize your email marketing strategy and reach more clients that are ready and in need of your services? I thought so. Read on to discover the tips, templates, and tools you need to make your email marketing campaign a success. One size fits all email campaigns don’t work. Your clients each have different needs, so why would you expect them all to respond to the same email? Targeted emails result in 18 times more revenue than those with a general message. Tailoring your emails to a targeted audience is crucial to success. For example, you can send out an email to only previous clients that says thank you and highlights relevant new or information about your law firm. Or, contact clients that have come to you for financial legal services with an email campaign right around tax time. Keep in mind that prospective clients themselves shouldn’t be the sole focus of your email campaign. Referrals bring in revenue too. For example, if your practice focuses on estate law, you may want to send your emails to financial advisors who can send you referrals. There are basically two ways of building a list of email recipients. Pay for a list of contacts, or build it yourself. Building a list yourself might sound labor intensive, but it actually isn’t. Plus, building your own list helps to you target your audience which means a higher rate of lead conversion for your firm. Having the resources from which to build your list is only part of the challenge. The goal here is to make every email that you send out count. So, how likely are each of these people to open an email from you? This should be a major factor when deciding to add a contact to your email list. Ask yourself the following questions for each contact. What is my relationship with this person? 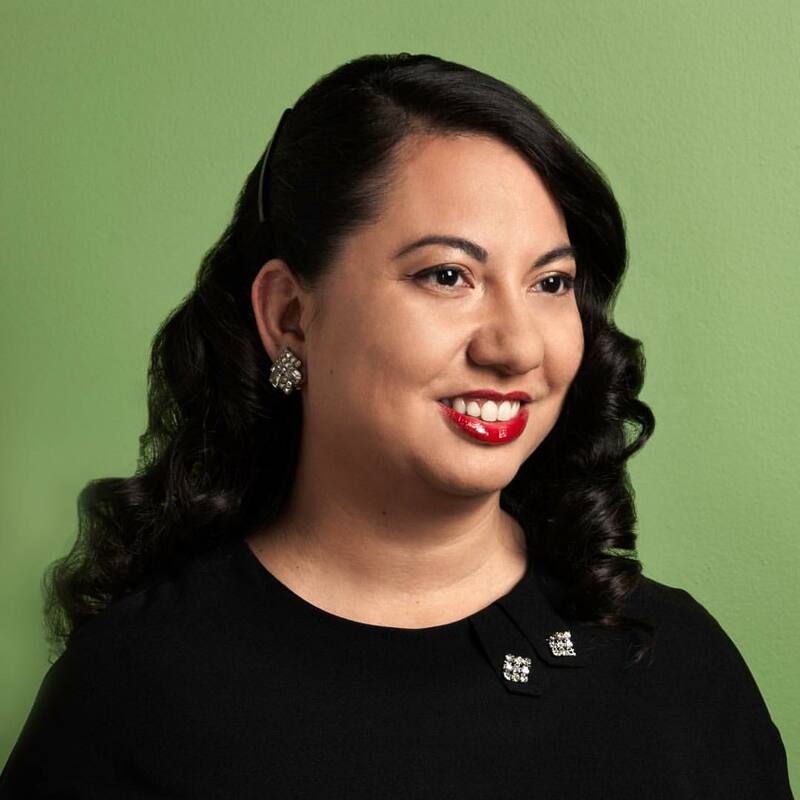 Will they recognize my name or the name of my law firm? Does this person have the need, or the potential need, for my legal services in the future? Does this person fit in one of the groups I am looking to target in my email campaign? Will this person perceive any value in the emails or newsletters I send out? If the answer is yes to any one of these questions, add them. These are the leads that have the most potential to convert into paying clients in the future. After you’ve identified who will receive your emails, you need to select the content you want to share with your recipients. The key here is to choose content that will be meaningful and valuable to each person who opens it. You want the people who receive your emails to look forward to reading them, so your content needs to be relevant, engaging and not give off the air of being a sales pitch. When it comes to email providers that make sending group emails a cinch, you have plenty of available options. Mailchimp, if you aren’t using it already, is one worth checking out. They offer a no charge service for recipient lists that are under 2,000 subscribers. Mailchimp is also accessible across multiple devices, so no need to be chained down at the office when you work on your email campaign. Have questions? Check out this review of Mailchimp applications for lawyers. Once you set up your free MailChimp account and import your list of recipients, you’ll need to create your email campaign. Click on Campaigns and then select Regular Campaign since you’ll be sending emails to the same group of recipients on a regular basis. From there, MailChimp will walk you through the rest of the setup process quite easily. If you’re sending emails to separate audiences, you’ll need to create multiple campaigns. Each campaign should have its own unique content that speaks directly to its members. After you’ve set up your initial email campaign, you’ll need to choose a template for your message. The template you select will determine how your email ultimately looks so don’t take this decision lightly. MailChimp has a generous selection of basic templates as well as some more sophisticated ones that have themes. If this is your first attempt at an email campaign, it’s wise to stick with a basic template until you get a firm hand on things. That said, there are certain components that are important because they build trust in you and your law firm, which is an essential element of building leads that will turn into paying clients. A headshot. People are less likely to contact you for legal advice if they don’t have a face to associate with your law firm. CTA for a free consultation, or another prompt that makes it easy and inviting to contact you. Quality content. Make sure that it has value for your targeted audience. If it is an introductory email, include a list of legal specialties and acknowledgements. You’ll also need to ensure that your template works on mobile devices. Look at these two samples of great legal email templates. 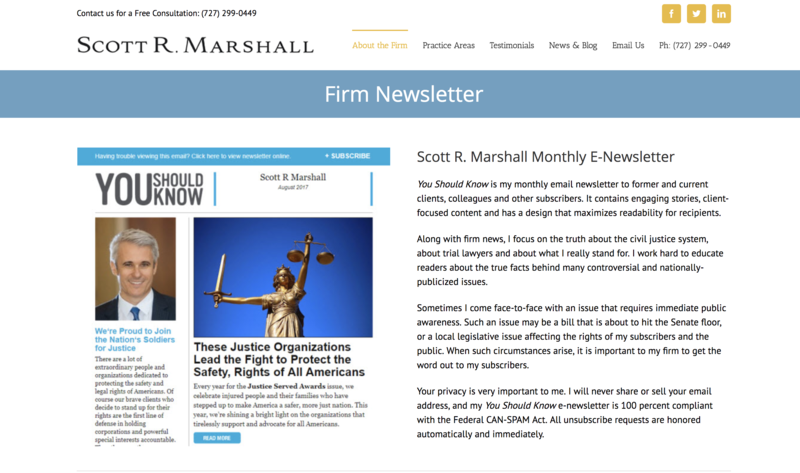 Scott R. Marshall created a landing page for his monthly e-newsletter that includes a sample of what readers can expect. 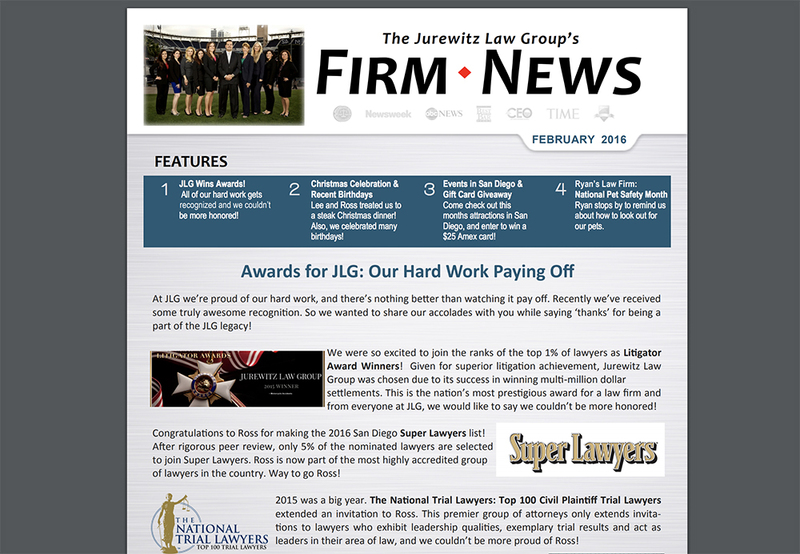 The Jurewitz Law Group sends out a monthly newsletter and also stores PDF versions on their website. The next step to getting your email marketing campaign underway is to write the email you want to send based on the content you chose earlier in the process. Write your email so that it’s digestible and understandable for people who don’t work in the legal profession. Keep in mind that the goal of your content is to get new clients into your office, or generate referrals that will produce hot new leads. Your content needs to be tailored to appeal to the audience that can make this happen. At a loss for content ideas? Try one of these. Teasers for blog articles, with a link that connects the reader directly to your site. Content that solidifies you as a valuable member of the community, such as highlights of community service or pro bono work. Any changes to your law firm, including recent awards, achievements or new members to your team. Snippets of free advice that encourages readers to contact you for more information. No matter how great your content is, it won’t matter if your subject lines don’t compel people to open the emails you send. To motivate as many as people as possible to read your emails, you’ll need to create inspiring subject lines. Recipients are more likely to open emails with subject lines that contain certain key words or phrase the subject in a certain way. Spend 10 minutes coming up with as many subject lines as you possibly can. Then, review your list from the perspective of your recipients. Identify a few subject lines that will inspire your readers to open your email and continue narrowing your list down to determine the best one. Once you’re satisfied with the email you’ve composed, you may be tempted to click send, but you should resist. You want your recipients to receive your email at a time of day when they’ll be most likely to have time to read it. Think about how your ideal clients spend their day and identify the time when they’ll be able to invest a few minutes in reading your message. For your email marketing campaign to be as successful as possible, you’ll need to constantly add new subscribers to your list of recipients. You don’t necessarily need to pay for advertising to attract new subscribers. Instead, you can just use your creativity. Where do you meet potential new clients and how do you approach them? For example, if you’re at a networking event, use the opportunity to build subscribers instead of just handing out business cards. The goal is to capture email addresses whenever the opportunity presents itself. Client meeting where additional people are brought along and free consultations are excellent avenues of building your contact list. You can help your email marketing campaign be even more successful by using your website to promote your emails. One way to make people aware of your campaign is to simply add a signup form to your website in a prominent location. 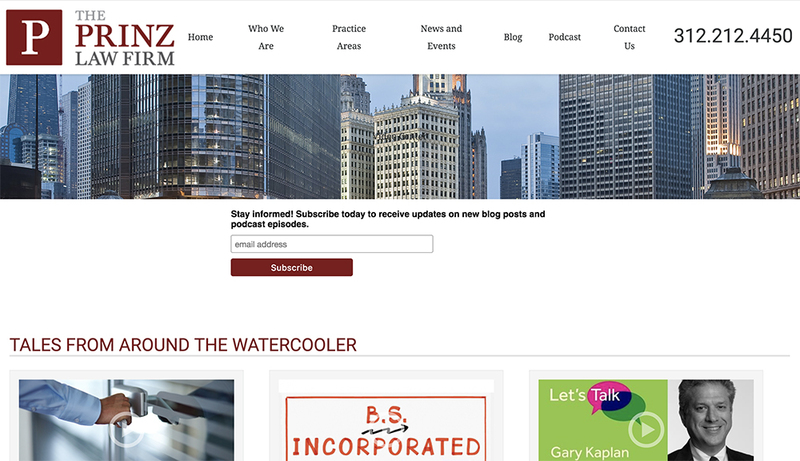 The Prinz Law Firm includes a subscription box on their blog and podcast pages. You don’t want to be a one-hit wonder with your email campaign. Even if your initial message is received warmly by your contacts, it won’t matter if your subsequent emails aren’t of the same quality. For your overall email marketing campaign to succeed, you need to make sure every message you send is consistently valuable and relevant to your audience. While it’s important to schedule your emails so that they’re sent at a time of day when your recipients are most likely to read them, it’s equally important for you to create a schedule that will fit into your busy routine. If you can only deliver quality emails once per month, then send monthly messages. Don’t overschedule and settle for sending anything but your best material. For example, if you know everyone will be putting their efforts into an important case, don’t plan on spending resources creating email content at that time. Plan ahead and have quality content ready to send at the right time. One thing that should be avoided at all costs is email overload. Once a month or every two weeks is great. Three times a week is bad. You want a reputation of respect and authority, not as a spam artist looking to generate business any way they can. Even if you rarely miss deadlines, it can still be difficult to stick to your email campaign’s schedule all the time. That’s where some advance planning and preparation will come in handy. Set a reminder for five days before you send an email so that you can prepare your message on that day. Set a second reminder for two days later so that you can refine your email content and make sure it’ll be valuable to your audience members. On the day before your email is scheduled to go out, review your message one last time. While email marketing campaigns are often rewarding and fun, they can take up a lot of time. 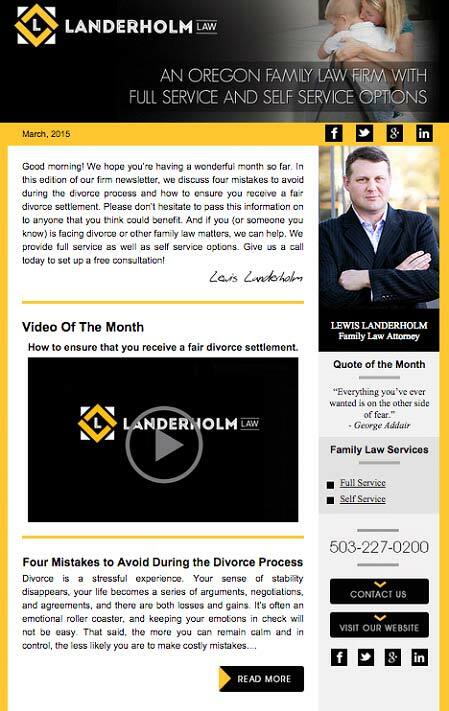 If you can’t carve out enough time to conduct an email marketing campaign on your own, connect with an attorney marketing agency that can run one for your law firm today.